Thank you to all those who voted for me for a second term as well as the residents and community leaders who partnered with my office over the past four years to accomplish the many victories we've won. Please join me Sunday at my State of the District address as we review the fights we've won and those to come. As my first term came to a close we passed some of our most important legislation to: uncover thousands of affordable homes for you, turn down the volume on construction noise, show how many children are being turn away from seats in their neighborhood, and studying how we can provide automatic benefits to New Yorkers who need it most. Taken together, these bills will help make New York City with more affordable housing, improve quality of life, education, and helping those most in need. I hope you had a great Thanksgiving, I remain most thankful for your support. With a new low in voter turnout I was able to pass legislation I authored to provide Online Voter Registration through the City Council to make it easier to register and vote. On the last day of November the City Council voted to rezone the East Fifties and stop the march of super-tall buildings for billionaires from 57th Street into the Sutton Area. Within minutes of the vote and our rezoning becoming law, an order was issued and all work was stopped at one of the potential sites in the district for a super-tall building for billionaires at 58 Sutton. This was the culmination of a three year first of its kind grass-roots community rezoning. After years of out-of-control out-of-scale over-development I wanted to put residents over real estate, and we did. With construction all around us, we are fighting to keep it safe, passing the Crane Modernization Act and continuing our advocacy to get unnecessary scaffolding down especially following a recent collapse injuring six. We are fighting for more public spaces with the opening of Andrew Haswell Green Park Phase 2A at 60th Street on the Esplanade, passing new laws requiring building owners to open public plazas with signage detailing required amenities with steep fines for non-compliance, and working with Spence to share their new Field House during school hours with public schools that have no regulation physical education space like P.S. 151 and P.S. 527. Our bike safety program has found new partners, brought 10% of all e-bike enforcement to our neighborhood, and continued to deliver results. I hope to see you on Tuesday, December 5 at 5PM, for our annual office holiday party, and again on Thursday, December 7 at 8pm (note the time change), where you can ask Mayor Bill de Blasio questions at his Town Hall for the Upper East Side. P.S. Happy holidays and have a happy New Year! If you’d like to pick up free Menorahs, you can do so at my office (donated by Chabad YP). Yesterday, the New York City Council voted to rezone the East Fifties and stop the march of super-tall buildings for billionaires from 57th Street into the Sutton Area. Within minutes of the vote and our rezoning becoming law, an order was issued and all work was stopped at one of the potential sites in the district for a super-tall building for billionaires at 58 Sutton. This was the culmination of a three year first of its kind grass-roots community rezoning. After years of out-of-control out-of-scale over-development I wanted to put residents over real estate, and we did. In 2015, we founded the East River Fifties Alliance, which has grown to 45 buildings in the area, and 2,600 individuals from 500 buildings all over the city with support from Friends of the Upper East Side Historic Districts, CIVITAS, and citywide organizations like the Municipal Arts Society. 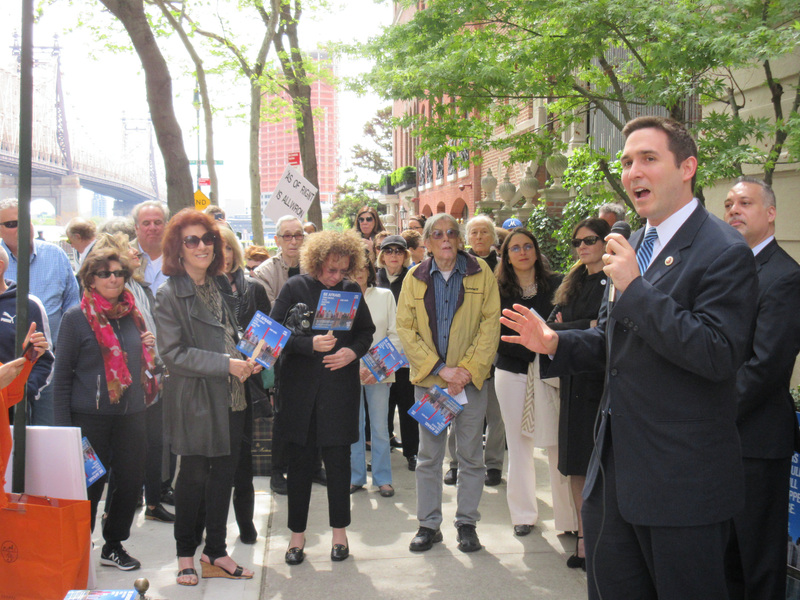 Council Member Dan Garodnick, Senator Liz Krueger, and Manhattan Borough President Gale Brewer joined me as co-applicants, and Congress Member Carolyn Maloney joined in support. This happened thanks to the support of residents like you. Heroes like Herndon Werth and Charles Fernandez stood up to buyouts and threats from billionaires. Leaders like Dieter Seelig, former President of the Sutton Area Community got us started and Alan Kersh, Robert Shepler, Jessica Osborn, and Lisa Mercurio put countless volunteer hours into ERFA. We did something no one thought could be done. They kept saying we would never rezone before they finished their foundation. We did just that yesterday and the work stopped just before they could finish their foundation or any other potential site in the neighborhood. The rezoning removed the grandfather clause and will protect the Sutton Area East of First Avenue from 52nd to 59th st from supertall towers by limiting zoning lot mergers, limiting the width of towers, and forcing most of the air rights to be used in the base of a building. The new developer had previously made thinly veiled threats to retaliate with inspiration from “The Count of Monte Cristo” and has promised to appeal, but we will continue to fight for you and to protect our community. The newsletter is back! We send the newsletter once a month so we don't clutter your mailbox and keep you up to date on everything going on in the community, as well as opportunities to influence government decisions by making your voice heard. Thank you to all the residents who came out to the polls in the Primary and General Elections, where we won with 7,847 votes at 75% and 22,514 votes at 81% respectively. This is a testament to our partnership and shows that empowering residents helps to govern honestly and inclusively—and it's the best way to get things done. During the blackout period when we could not send government newsletters because of our pending elections, we won Universal School Lunch, launched ferry service and opened Cornell Tech on Roosevelt Island, rolled out bus countdown clocks, broke ground on $35 million in improvements to the East River Esplanade, signed tenant safety legislation I authored into law, and I was even recognized as one of the best Council Members by City and State. Last month we broke ground on $1 million in renovations to the East River Esplanade in partnership with the Hospital for Special Surgery, cut the ribbon on a new laboratory building with Memorial Sloan Kettering, made progress on rezoning Sutton to stop supertall skyscrapers, passed two bills so that schools ensure no child goes hungry and train teachers to support GSAs, passed legislation to open the city's $85 billion budget and welcomed the Technion Israel Institute of Technology world tour. As we welcome the autumn temperatures of October for those of you who celebrate Shannah Tova as I reflect during these days of awe, if I or my team have disappointed you, please let me know so that we may seek your forgiveness as we try to do better in the coming year. It is deeply sad that October started out with the tragic and horrifically violent events in Las Vegas that took the lives of at least 59 people. I hope that this nation can finally adopt gun control and that this coming year be a blessed one filled with peace, health and joy. September was a month with many timely hearings surrounding several pieces of legislation my office is trying to turn into law. Whether it is taking on construction noise, making Zero Waste by 2030 a law, banning toxic pesticides in our City’s parks or even supporting students with Gender-Sexuality Alliances in our schools, I have been working to improve our great City. Now that flu season is just around the corner I want to invite residents to our October Annual Senior Health Fair on Thursday, October 19 from 11am to 2pm at Lenox Hill Neighborhood House where No-Cost flu shots will be available to residents who RSVP. If you are interested in the Participatory Budgeting process and being a key part of deciding how the community spends $1 million, now is the time to get involved and submit your ideas. On Tuesday, October 17 at 6pm join us for a Participatory Budgeting Assembly at my District Office at 244 East 93rd Street RSVP. If you can’t make it that day make sure to submit your ideas online. P.S. If you’d like to meet with me this month keep in mind that First Friday is canceled in observance of Sukkot but you can still meet with me on specific policy ideas during Brain Storming with Ben on Tuesday, October 10, at 6pm RSVP. Happy Labor Day, welcome back to school and, for those who celebrate, Happy Jewish New Year. New York City is the first city in the country to guarantee legal representation to tenants facing eviction with a new “Right to Counsel.” We also enacted laws I authored to protect tenant safety from landlords who fail to make repairs or never finish. Commutes are getting better. We launched a ferry service on Roosevelt Island, after years of advocacy, travel is now available by air (by tram), land (by car, bus, and train) and now water (by ferry), all offering improved commutes. Ferry service will be coming to the Upper East Side next year. You may have noticed new bus countdown clocks throughout the neighborhood. I also proposed solutions for the MTA to improve subway service and hope you will join our fight to cuts to crosstown bus service. I hope you will join us for our annual Town Hall with city agencies and free reusable bags, as well as our Emergency Preparedness Event with Free Go Bags. P.S. Brain Storm with Ben is canceled in September so it does not conflict with the Primary Election. First Friday is canceled in October for Religious Observance of Sukkot. In July, the New York Times covered legislation to quiet noise in our city, scaffolding and our communty's efforts to fight overdevelopment. We also broken ground on the reconstruction of the East River Esplanade with $35 million that I secured as co-chair of the East River Esplanade Taskforce with Congress Member Carolyn Maloney. Happy Fourth of July as we celebrate our nation's independence and remember that in every generation we must do our part to fight injustice. Last month, we won more victories in our fight against overdevelopment and for affordable housing. Community Board 6 set a quick 21-day timeline in June voting unanimously for a community-led rezoning of the Sutton Area that trades height for affordability. The Rent Guidelines Board which sets rents for 1.6 million rent-stabilized apartments voted for a low increase of 1.25% on one-year and 2% on two-year leases after two consecutive rent freezes. In June we celebrated Pride and graduations for both our students and PTA Presidents. I joined the Pride March and introduced legislation on behalf of East Side Middle School students to encourage Gender Sexuality Alliances. I also shared congratulations and the secret of life with students graduating from schools in the district and thanked PTA Presidents for their service. This summer, I hope you will take advantage of our parks, especially the Indoor airconditioned tennis courts at the Queensboro Oval now open to the public for as little as $15 or join me for Theatre in Carl Schurz Park. If you are as big a fan of healthy farm to table food as I am, I hope you will join me for Cooking with Kallos or participate in our Fresh Food Box one week to see how you like it. 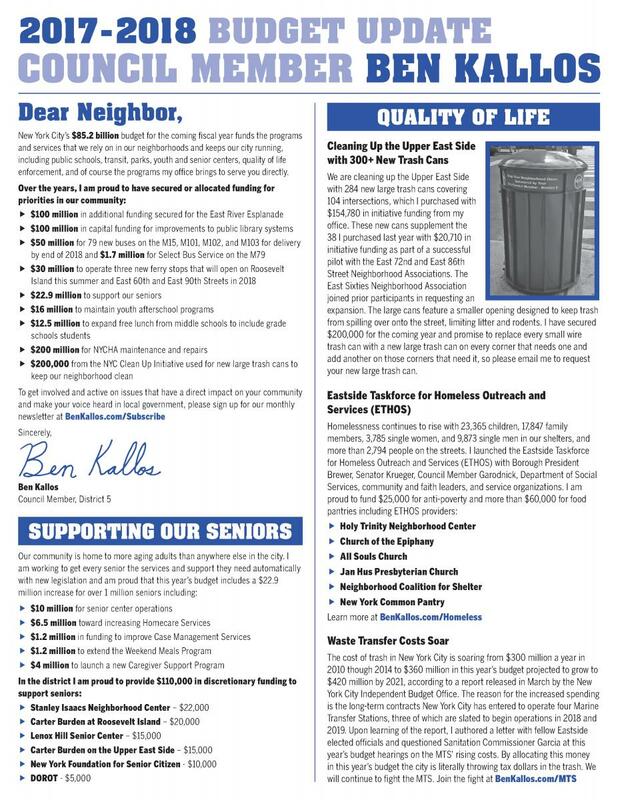 Even though we can't send our newsletter by electronic mail to those who subscribed through BenKallos.com for the next couple of months, we are keeping our promise to keep you informed by posting our newsletter on our website and circulating it through social media. If you want a printed copy you can come pick it up from our District Office. Please consider forwarding this newsletter on to anyone and everyone. N.Y. Classical Theatre: Sheridan's "The Rivals"
New York City’s $85.2 billion budget for the coming fiscal year funds the programs and services that we rely on in our neighborhoods and keeps our city running, including public schools, transit, parks, youth and senior centers, quality of life enforcement, and of course the programs my office brings to serve you directly. Over the past 11 days, seven cases of legionnaires disease have been reported in the Lenox Hill area of the Upper East Side, according to the Department of Health and Mental Hygiene. Of the seven cases, four patients are recovering and two have already been discharged from the hospital. Sadly, one member of our community has died, and my thoughts and prayers are with their loved ones. 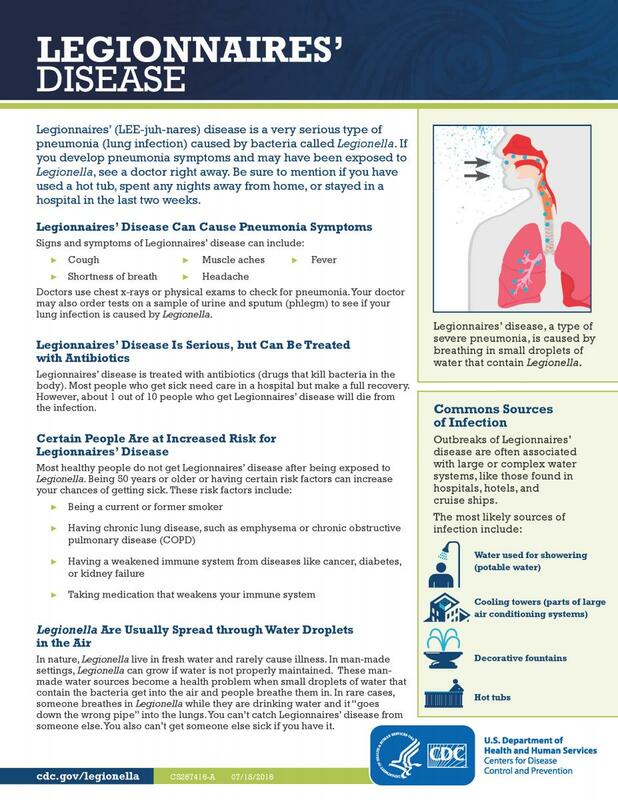 Legionnaires’ disease cannot be spread from person to person. Those at high risk include people aged 50 or older, especially cigarette smokers, people with chronic lung disease or with weakened immune systems. In 2015, following the outbreak in the Bronx I co-sponsored legislation introduced by Speaker Melissa Mark-Viverito, which was signed into law as Local Law 77 of 2015 to require registration, inspection, cleaning, disinfecting, testing, and annual certification in order to reduce and contain the growth of Legionella in cooling towers, which causes Legionnaire's. I am in close contact with the Health Department as they identify the source of the cluster and eliminate it as quickly as possible. 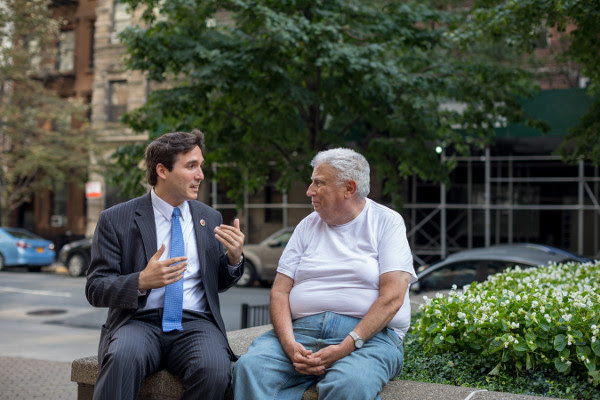 You can get more timely updates on Twitter at @BenKallos or @nycHealthy.